FX’s critically acclaimed anthology series American Horror Story is back with fresh episodes to creep out viewers, this time with a season aptly subtitled Apocalypse (the plot centers around a world in nuclear winter where the few survivors live in underground “outposts”). We partnered with Inscape, the TV measurement company with glass-level data from a panel of more than 9 million smart TVs and devices, to examine viewership trends around the series. Also below: advertising analytics courtesy of iSpot. We first examined crossover between the last season of AHS (subtitled Cult)and the premiere. 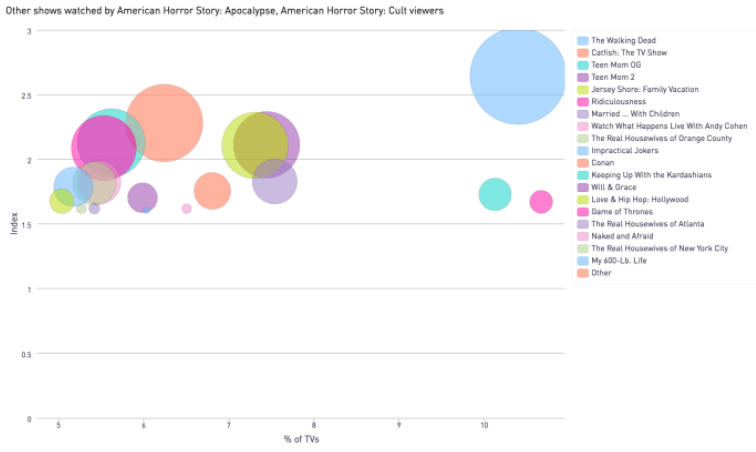 Of those households that checked out the premiere of Apocalypse, 42% had also watched Cult — but only 15% of Cult viewers have tuned into Apocalypse so far. And although another post-apocalyptic show (The Walking Dead) tops the list of other series watched by these viewers, reality TV seems to be their genre of choice overall, with Catfish: The TV Show, Teen Mom OG, Teen Mom 2 and Jersey Shore: Family Vacation ranking high. 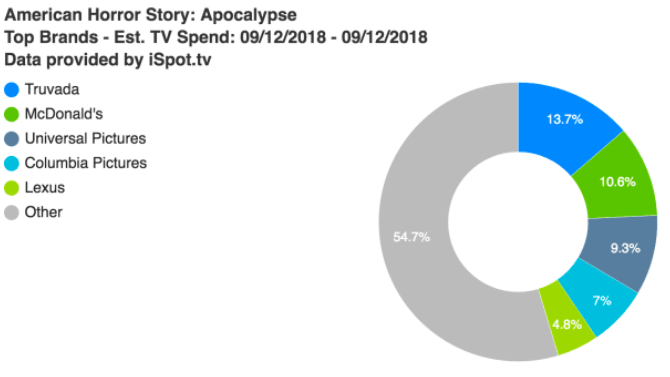 Data from iSpot.tv, the real-time TV ad measurement company, reveals that 28 brands spent an estimated $1.5 million on commercials that generated 156.8 million impressions during the AHS premiere. Truvada, McDonald’s and Universal Pictures were the top three brands when it came to spend. Notably, spots during the show had an average Attention Index of 119, meaning they received 19% fewer interruptions than average (interruptions include changing the channel, pulling up the guide, fast-forwarding or turning off the TV). Truvada, Sprint, Heineken, Michelob and Taco Bell all had Attention Indices over 130.